Sometimes I suddenly think about a game I played and enjoyed a few years back, and wonder if I should let it rest or should replay that game. The thing with most old games is that even though I really enjoyed playing that game before, it will most likely feel very outdated and not as much fun if I would re-install that game today. I’m not a “graphics over gameplay” guy per sé, but there is only so much I can tolerate when it comes to outdated graphics, low res textures, and octagon shaped character heads (even in Minecraft! ), so I always try to make the decision if replaying that game will still be enjoyable or if the game will most likely cause a lot of frustration nowadays. Thinking this over, I decided to give GTA San Andreas a spin, because I feel that the game engine was designed with PC gaming in mind, rather than a crappy console port like GTA IV was. So I dug up my DVD, installed the game, and started it up. That’s when the first signs of old age showed. GTA San Andreas is designed to run on 4:3 aspect ratio monitors, e.g. with a screen resolution of 1600×1200 pixels. A while later Rockstar Games release patch 1.01, which added support for 16:9 aspect ratios, e.g. a screen resolution of 1920×1080. The thing is that I own a monitor with an 16:10 aspect ratio and a resolution of 1920:1200. 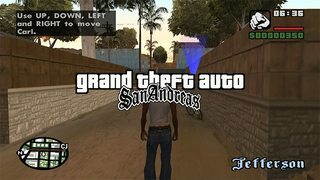 GTA San Andreas will just ignore the fact my monitor has 1200 vertical pixels instead of 1080 and will smear the image that should be displayed in 1080 vertical pixels all over the available 1200 pixels, resulting most notably in thin/long/stretched characters, and oval wheels on cars. Besides the 16:9 / 16:10 aspect ratio issues, the widescreen gaming implementation that Rockstar released never really was that good. The lower right mini map, for example, will be stretched from a perfect circle when playing on a 4:3 aspect ratio monitor to a oval shaped blob when playing on a 16:9 of 16:10 aspect ratio monitor. Luckily, a mod exists to fix this, which can be found on this Github page. It states it requires both Widescreen HOR+ Support and Silent’s ASI Loader, but I suggest installing the Cleo Library from here, because it contains Silent’s ASI loader as well, so you end up with both existing GTA San Andreas mod loaders installed side by side. 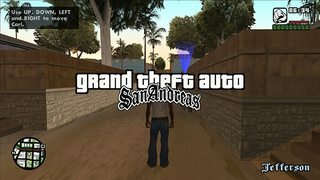 Installing the above mentioned mods fixed the aspect ratio madness and restored GTA San Andreas to a true 16:10 aspect ratio, both in the 3d world, and OSD stuff like the mini map. With the aspect ratio now fixed, I tried upgrading the graphics a bit by installing a high res texture pack. One of the great advantages of PC gaming, compared to console gaming, is that everything can be modded, so after a quick look around, I found a project called HRT Mod, but sadly version 1.4 is scheduled for release in 2015. Luckily it turns out that version 1.3 is available as well, so I downloaded the manual install and installed the textures from the archive. I didn’t bother with the ENB after effects, because that’s stuff I keep for Skyrim. I ended up with a very playable and enjoyable installation of GTA San Andreas, that can still be played in 2014 without being a constant reminder that the game is already over 10 years old. If you liked GTA San Andreas before, I suggest you give it a (re)try, because with these mods installed, you won’t be disappointed!